According to Ian Wilson and Rex Morgan, Knights Templar rescue the Shroud from the downfall of Constantinople and hide it (possibly in Acre, the Templar stronghold) in the Holy Land possibly until its demise in 1291. Others, such as Barbara Frale and John Thavis, both Vatican researchers, believe the Shroud was brought later to France and used as part of high rituals with the Knights Templar. Wilson and Morgan believe it resided after 1307 in Templecome, England. Geoffroi II de Charney, son of Geoffroi I, held another exhibition of the Lirey Shroud. He died in 1396 and his daughter Margaret became the Shroud’s owner. Around this time the Shroud, passed from Margaret to the House of Savoy. The Shroud was moved to the chapel of a Savoy and church in Chambery, France. Fire broke out in the sacristy of the Chambery church and molten gouts of silver burned through the Shroud. Poor Clare nuns cut away charred cloth around the burn holes and covered them with triangular pieces of cloth. They also applied a backing cloth to the Shroud and from what we know now used a technique called French reweaving to repair the edges of the cloth. On September 14 the Holy Shroud was transferred to Turin from Chambéry to shorten the trip of Carlo Borromeo, the Archbishop of Milan, who had made a vow to go worship the Sacred Linen. This was the first modern Turin exposition. The Shroud was then on display in many occasions in the following centuries, in the Cathedral and in piazza Castello, to celebrate liturgical feasts or the Home of Savoy dynastic anniversaries. An eight day exposition of the Shroud was held in Turin. 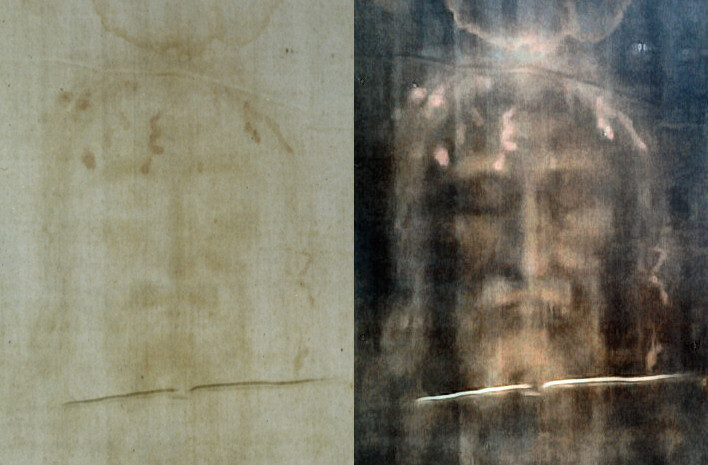 Secondo Pia took the first photograph of the Shroud and discovered that the full size dorsal and frontal images of a crucified man on it were negatives showing striking details. At the outbreak of World War II the Shroud was moved to the Benedictine monastery of Montegergine in the mountains of southern Italy. It was returned to Turin in 1946. The Shroud was shown to members of a special scientific commission. New photographs in both color and black and white were taken. Max Frei, a Zurich forensic expert, removed pollen samples and two small pieces were cut from the main body of the Shroud (5 square centimeters) and from the side strip (3 square centimeters) for study by Prof. Gilbert Raes, director of the Ghent University’s textile laboratory. At a public exhibition the Shroud was shown for the first time on television. Plans began to have the Shroud carbon dated and a team of scientists called STURP (Shroud of Turin Research Project) visited the cloth from 27 August to 8 October and during this time an intensive five days of non-destructive tests were done. noticed faint writing on the Shroud. Michael Tite of the British Museum’s Research Laboratory established dialog with the laboratories in Arizona, Zurich, and Oxford as well as four other laboratories to see if they would accept samples of the Shroud for Carbon dating. All six agreed. Other discussions continue with the Holy See Mission to the United Nations in New York to discuss the Turin workshop on carbon dating the Shroud which was deemed a preliminary step to be done prior to the actual carbon dating. The Turin workshop on carbon dating the Turin Shroud chaired by Carlos Chagas, President of the Pontifical Academy of Sciences, was held in a seminary in Turin from 29 September to 1 October 1986. The three radiocarbon laboratories were selected to date the Turin Shroud and a letter was sent to each by the archbishop of Turin in 1987. Ugolotti’s findings of faint writings on the face of the Shroud were further studied in 1997 by the late Andre Marion, director of the Institut d’Optique Theorique et Appliquee d’Orsay, France and his student Anne Laure Courage.